Where the legendary Rhine meets the Moselle in Koblenz, Germany, Viking River Cruises christened two Viking Longships last week, the Viking Hild and the Viking Herja. Photo: © Viking Cruises. Unauthorized use is prohibited. It's hard to believe it's been five years since Viking River Cruises first debuted their innovative, next generation Viking Longships in 2012 and since then, the company has launched 50 of these river-going vessels, and set two world records in 2013 and 2014! Today, the company sails more than 60 Viking river ships along the waterways of the world from Europe to Asia to Africa; and since my first river cruise in 2012, it has become my preferred, not to mention convenient method of traveling through the heart of Europe! 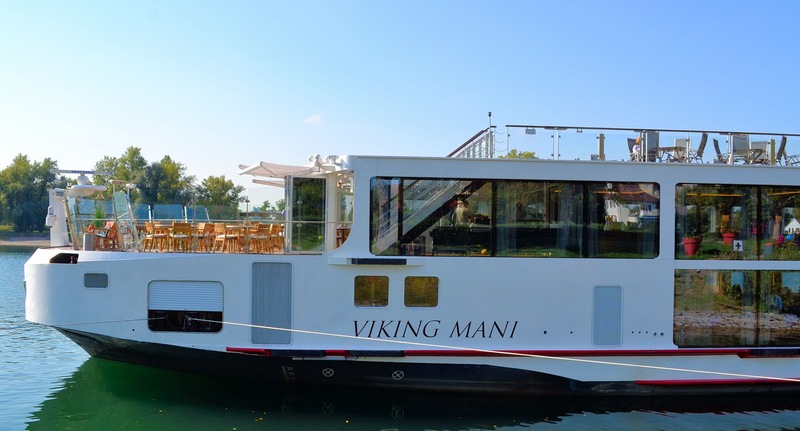 Viking welcomes two new Viking Longships to the fleet: the Viking Hild and Viking Herja. Pictured here are the two new longships with the imposing Ehrenbreitstein Fortress providing a stunning backdrop to the overall scene. Photo: © Viking Cruises. Unauthorized use is prohibited. Where the legendary Rhine meets the Moselle, beneath the imposing Ehrenbreitstein Fortress in Koblenz, Germany, Viking River Cruises christened two Viking Longships last week, the Viking Hild and the Viking Herja with their godmothers presiding over the ceremonies. 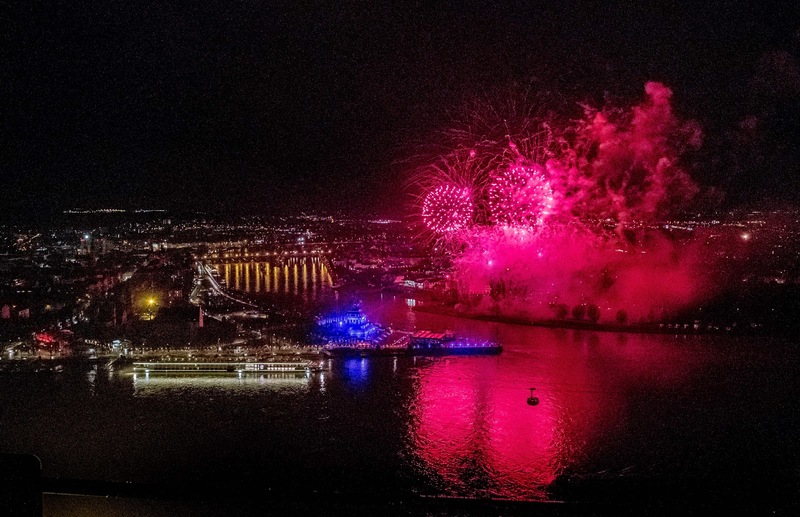 Amid the pomp and circumstance, Viking Cruises also celebrated its 20th anniversary that ended the evening with a spectacular dazzling fireworks display above the entire area. Fireworks lit up the night in Koblenz, Germany, last week as seen from the Ehrenbreitstein Fortress across the Rhine River. Photo: © Viking Cruises. Unauthorized use is prohibited. According to Norse mythology, specifically the 13th-century "Prose Edda," Herja, the "Decider of Fates," was a mighty valkyrie—one of the "nymphs of the battle" who decided the fate of Viking warriors after they met their fates. Like her sister, Hild, aka Hildr, is also a valkyrie but she is known as the "Giver of Everlasting Life" and escorts souls to the Valhalla where they will feast and prepare for the ultimate battle with Odin, the god of war and death. 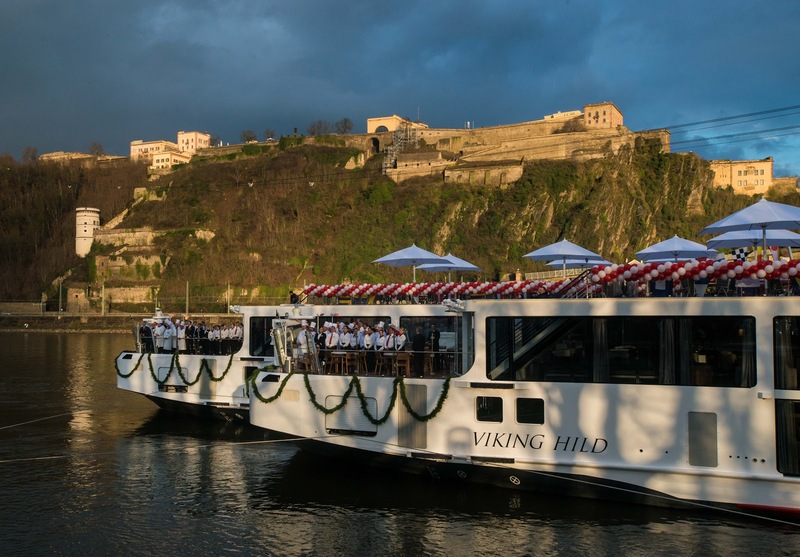 The Viking Hild, its earthly manifestation, is scheduled to ply the waters of the Rhine this spring along Viking's new "Paris to the Swiss Alps" itinerary, and later the year, both new builds will sail the Rhine Getaway and Danube Waltz, two of my favorite river cruises. Unforgettable doesn't begin to describe these journeys filled with iconic landmarks and steeped in tales of old. A voyage to the past and present on the Rhine River in Germany. This view of the River and the village of Spay on the opposite bank was taken from Marksburg Castle. Photo: © EuroTravelogue™. Unauthorized use is prohibited. 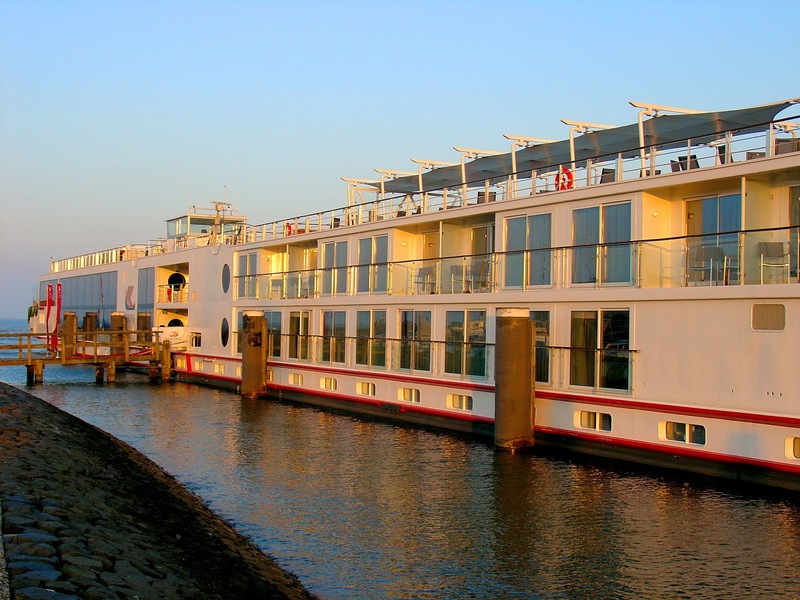 "Two decades ago when we started this company, modern river cruising was still unknown to most travelers. 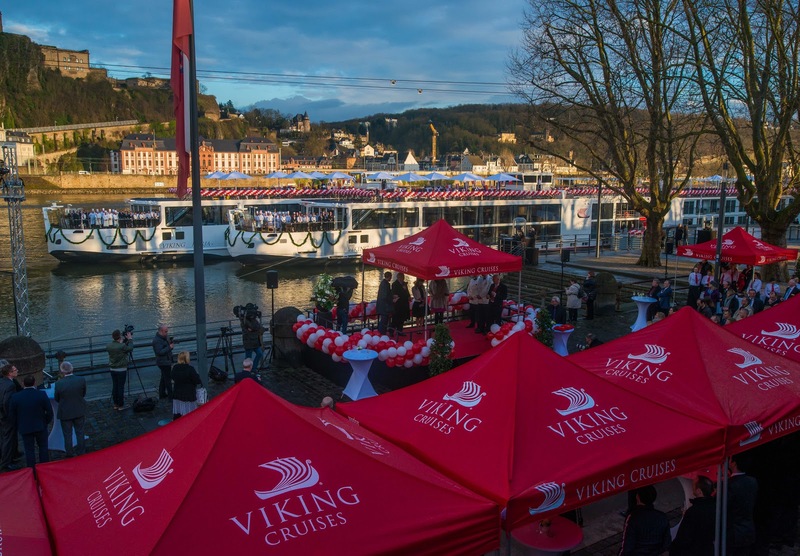 Now 20 years later, we are pleased that most travelers know river cruising, and they know Viking as a household name,” said Torstein Hagen, Chairman of Viking Cruises. “The naming of a new ship by a ceremonial godmother is a sacred maritime tradition. We are honored that the godmothers of our two new Longships are also important partners who will help us deliver thoughtful and enriching experiences for Viking guests this year." The Viking Odin is one of the first Viking Longships launched in 2012. Seen here at sunset in Volendam, The Netherlands. Photo: © EuroTravelogue™. Unauthorized use is prohibited. Meet the Viking Longships. Photo: © EuroTravelogue™. Unauthorized use is prohibited. If you haven't yet enjoyed a Viking river cruise aboard the Viking Longships, take a tour through the ship and discover life onboard as well. Accommodating 190 passengers, these vessels are elegantly appointed in Scandinavian design and feature "green" technological innovations including energy-efficient hybrid engines, herb gardens, solar panels and my favorite, the Aquavit Terrace at the front of the ship that invites the outdoors in. It's my favorite gathering place for quick meals throughout the day. The main restaurant is one level below from the Viking Lounge and Aquavit Terrace and is full-service dining at its best serving regional favorites with only the freshest ingredients, some of which are grown right on board! 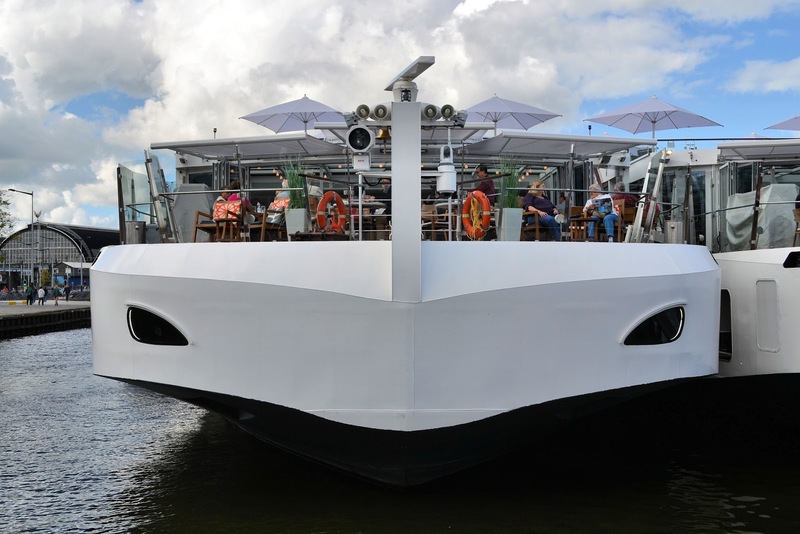 The Aquavit (waters of life) Lounge extends outdoor at the front of the ship, prime viewing location for cruises through the Middle Rhine in Germany as well as the Wachau Valley in Austria. Photo: © EuroTravelogue™. Unauthorized use is prohibited. And if that isn't enough to whet your appetites, Viking offers a superior product that exceeds expectations on all accounts. With an unswerving dedication to exceptional guest service, Viking provides enriching and culturally immersive itineraries that bring to life the myriad ports of call. And just wait until meet all of your new friends along the way. To sum it all up, elegance and efficiency combined with Viking traditions and intimate settings are at the heart of these magnificent longships! The first of the Viking Oceans liners, the Viking Star debuted in 2015 and is seen here docked in Gibraltar. Photo: © EuroTravelogue™. Unauthorized use is prohibited. To add even more excitement this year, sister company Viking Oceans launched its third ocean ship, the "Viking Sky" in February and in November of this year, the "Viking Sun" will sail on its maiden voyage bringing the total number of ocean-going vessels to four—quite a significant milestone for a company that's only been in the ocean cruising business for two years! By 2019, the fleet will grow to six ships establishing Viking Oceans Cruises as the largest small-ship ocean cruise line in the world! 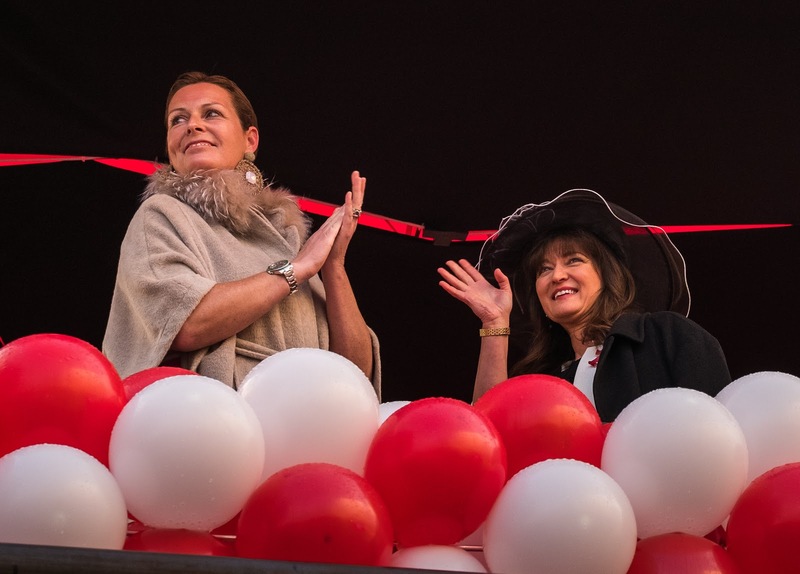 Dr. Princess Stephanie Löwenstein-Wertheim-Rosenberg, left, and Debbie Wiseman MBE honored as godmothers of the new Viking Longships. Photo: © Viking Cruises. Unauthorized use is prohibited. In keeping with the maritime tradition that dates back thousands of years, Viking invited two prominent women to serve as honorary godmothers to the Viking Longships both of whom represent what the company proudly refers to as "the Viking Difference"—destination-focused food and wine experiences and cultural enrichment. Have you ever dreamed of a voyage along the legendary rivers of Europe; sailing by magnificent castles, storybook villages and pastoral countrysides while immersing yourself into the fascinating cultures along the way? Imagine visiting three, four, even eight countries in a single voyage filled with unforgettable memories in each. Isn't it time you discover the wonderful world of river cruising? My family and I did a Viking cruise over Christmas a few years back. It was truly wonderful! Hi there Cat and thanks so much for stopping by! Funny, I was a Christmas Market river cruise in Dec 2013, the Danube Waltz actually, and fell in love with Europe at Christmastime, despite the frigid temps. When did you go? Which cruise did you sail? Thanks again. Incredible - what a fun backstory to read! My husband just mentioned to me a few nights ago that he wants to take a Viking River Cruise. I remember when they debuted in 2012, my children were 4 and 8 and I thought that we could do this as a family. Not! LOL!! I quickly learned this experience was for a more mature crowd. But I absolutely love the excursions the river cruises take passengers on through Europe. It's an experience that my husband and I will be signing up for very soon. Hi there Char! You're right, Viking is definitely a more mature crowd. I am curious. Did your kids have a good time despite their older friends? ;) I too love the excursions and the cultural immersion they provide for all who sail. Hope you sign up again real soon. Thanks for stopping by and sharing your thoughts! Bon voyage! Ahhh, I am ACHING to try Viking River Cruises! Everyone I've spoken with who has done their trips has loved them, and these new ships seem awesome! Hi there Lillie! I couldn't agree more with you my friend, on all accounts! They truly are a wonder and the experience unforgettable. Thank you so much for stopping by and sharing your thoughts and here's to hoping your voyage lies on your horizon! This looks great, I hope to be able to take a Viking Cruise one of these years Jeff. Hi Noel! So good to hear from you. I sure hope you sail with Viking soon, I believe you'll love it as much as I do. Thanks so much for stopping by and sharing your thoughts!